In this blog post, I will cover section 1 objective 1.1 of the VCAP6-NV Deploy exam. First things first, after downloading the NSX OVA file, right click on the cluster you want to deploy the appliance in and click Deploy OVF Template. Browse to and select the NSX OVA file and click Next. Enter a name for the VM and location. Click Next. Select a host to deploy to. Click Next. Select a storage location. Click Next. Select a network to connect the vNic to. Click Next. On the customize template page, provide DNS, IP address, Hostname. etc. Click Next. Review your settings. Click Finish. Open a internet browser and browse to the IP address or FQDN that you configured for the NSX Manager. Enter the admin username and password. Click Login. 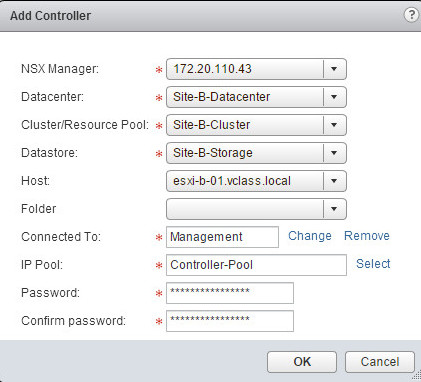 Under the Manage tab, click NSX Management Service. Click Edit by Lookup Service URL. Here we will enter in the IP or FQDN of our vCenter service if you are running a vCenter with a embedded database. If you are running a vCenter with a External PSC then you will need to enter the IP of FQDN of the external PSC. Also, provide the SSO administrator username and password. Click Ok.
Now let’s register with our vCenter server. Click Edit by vCenter Server. Enter the IP or FQDN of the vCenter server and the vCenter administrator username and password. Click OK.
Once the Lookup service and vCenter server registration is complete, we will be able to see the Networking & Security icon on the vCenter home page. 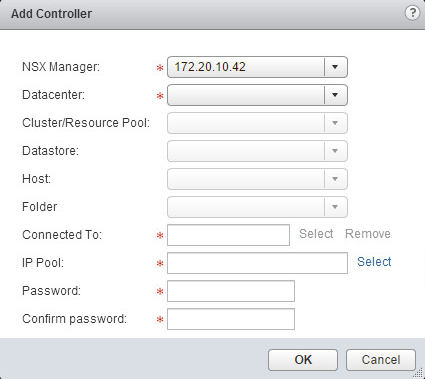 Log off of the NSX Manager. Log into the vCenter server and notice the new Networking & Security icon. Since I will be using vRealize Log Insight as my syslog server, I first need to prep it and install the NSX content pack. I log into my log insight appliance and under content packs I find the NSX content pack and install it. 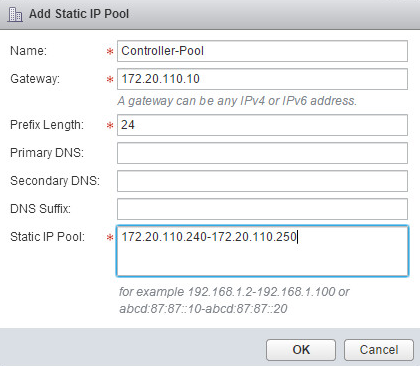 Enter in the information for your Syslog server and click OK.
Click New IP Pool…at the bottom of the window. We need to create a pool of IP addresses that will be assigned to the controllers automatically when they are deployed. Fill in the appropriate information and click OK. 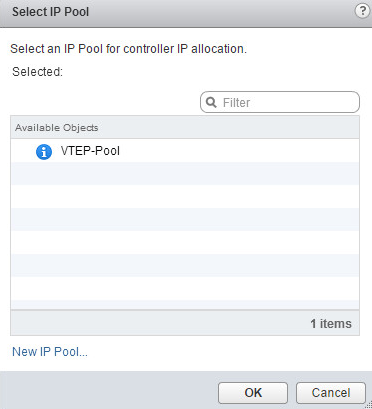 Fill in the appropriate information for adding the controller and select the newly created IP Pool. Click OK. Wait on the controller to deploy and show Normal in the Status column. You will need to deploy 3 controllers. Do not try to deploy any subsequent controllers until the first controller is fully deployed and status is showing normal. Select the VMs that you want to exclude. Click OK.
Pingback: VMware VCIX6-NV Unlocked - Experience and Tips - Clouds, etc.Clouds, etc.